On Saturday, I got the chance to ride along on a BBQ bus of epic proportions, courtesy of a contest put on by the good people at Google Places and ManUpTexasBBQ. We hit 3 joints I’d never heard of, ate meats I’d never encountered, and drank our fair share of Lone Star beer on a school bus outfitted with blacked out windows, disco lighting and a stripper pole. Memorable. We started at Austin legend Sam’s, on East 11th. A massive pit just behind the register kicks out enough heat to render meats nearly to the melting point, and to bump the ambient heat in the place to sauna-esque levels. The walls are yellow, I think, but so covered in faded peeling photographs, pages ripped from magazines, and record covers that it’s a little hard to tell. 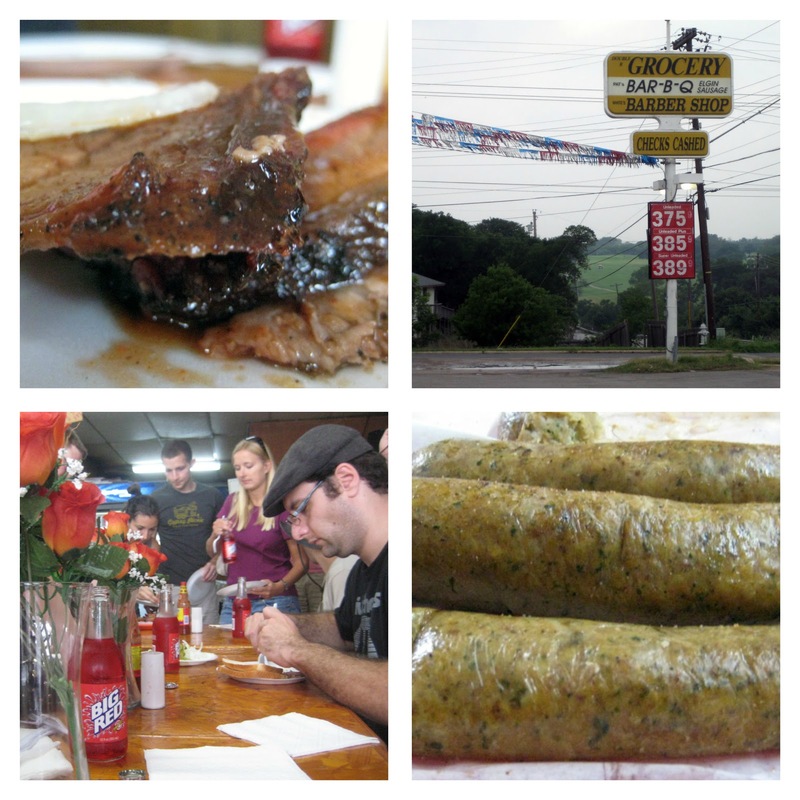 We sampled both the brisket and the mutton. Both were as moist as any meat I’ve tasted. If you have no teeth, and you would like to enjoy a meal of brisket, this place is your ticket. I found the brisket tasty, but a little bland – just meat and smoke going on here. The mutton – first I’ve ever had – was better, blackened and crispy on the edges, incredibly tender, and just a touch gamy. This stuff is seriously rich eating - a few bites and I was stuffed. Perk: we actually got to go back stage at Sam’s and take a peek at the pit. Literally, this is a brick wall with a grate on top and fire underneath. That’s it. Asked how he avoided overcooking the meat, the man running the pit said “this is barbeque, there is no such thing as overcooked” Indeed. Stop two was Willies, way out at Springdale and MLK. We outnumbered the seats at Willies by a good margin, but thankfully they had the meat, and the bottles of Big Red to handle us. Brisket was good, but unmemorable, with more unrendered fat than I like. The score here was the boudin. I only know boudin from the hundreds of billboards dotting I-40 between Beaumont and Mobile, often featured next to an alligator and promising parts of animals I’d never really planned on eating. I had no idea what it was - alligator foot sausage? Turns out I was wrong - boudin is pork and rice sausage, different than any sausage I’ve ever had, and, as Willie's does it, totally delicious. Texture-wise it’s almost like a Greek dolma, heavy on the meat. But the taste is another thing entirely, starting mild and a little peppery, and ending with a kick (maybe jalepeno?) that just made me want another bite. Our last stop for the day was also the highlight. 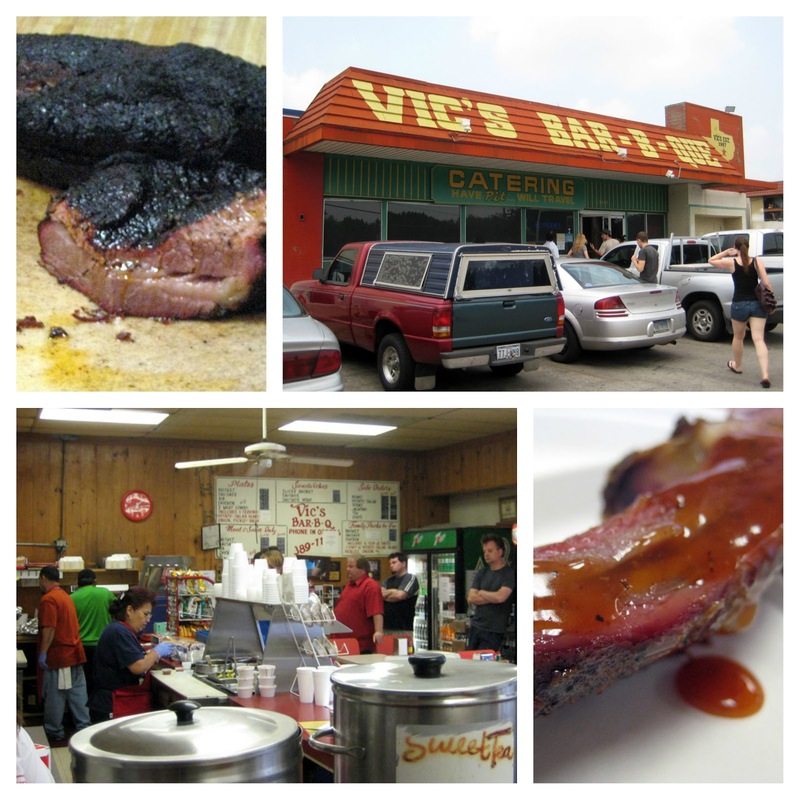 Vic’s, off of 71 just east of I-35, is in a different league than Sam’s and Willie’s – bright, well air-conditioned, and spacious. It’s no Lambert’s, but it's also not a dive. 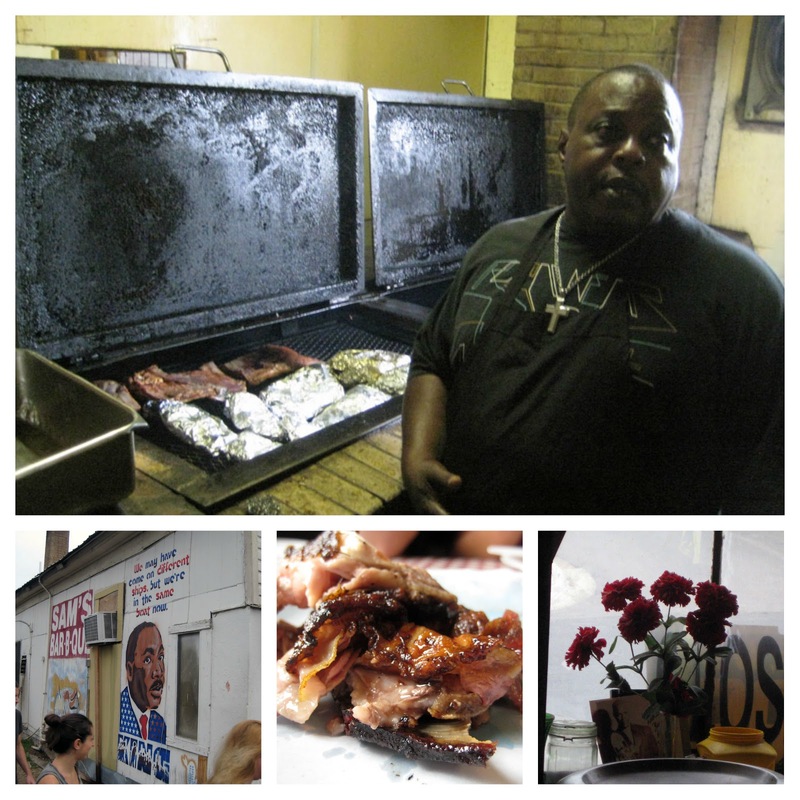 The walls here are decorated with row after row of awards – best pork ribs, best beef ribs, best brisket. We did all three at Vic’s, and each one outdid the last. The brisket was cut thin and brilliantly spiced, tender, but not so greasy that you couldn’t dig in. The beef ribs, glazed with a sweet and slightly spicy crust were monumental and amazing – the meat fell off the bone and the flavor just went on and on. But the final play here, and the best thing I ate all day, hands down, was the pork ribs. These may be the best ribs I’ve ever bit into, even after a day of eating BBQ. The intense flavor in the crust, especially the blackened bits contrasted gorgeously with the slightly salty, tender bites of pork. Four hours after we set out, in the quiet haze of a meat coma, we arrived back at our starting point. Mad props to Whitney and the gang at ManUp for making this happen. It's a Saturday I'm not going to forget. Great "meating" you also. :-) I like the pics and the review. See you at the next foodie event! I'll do you one better Whitney - emailing you the link to the full set of photos as we speak.